Who owns the patent on the body: God or man? Who has the right to state how it may be used and how those who break the rules may be prosecuted? Or, is it a dual ownership? After all, he has said, “Ye are gods.” (John 10:34) And we have the instruction to rule over nature (Gen 1:28). Could that not include inventing ways to maintain good health? If cloning and body donations facilitate this, why not promote them? We humans enjoy pushing every limit, spinning webs and constructing devices for problem solving. We let our conscience be our guide when we ought to question our sense of propriety. What is the right way to view and to treat humans? Will we be careful in our judgments, relating each ethical question to the sanctity of human life made in the image of God, striving for a consistent life ethic? Or, will the ground of our deductions be whether or not personal consent has been given? This is a question for us, for Christians. We already know how the world will rule. 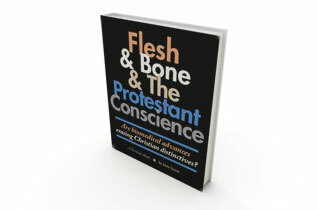 The above excerpt from the Flesh & Bone & The Protestant Conscience ebook brings into focus the controversy between utilitarian and Christian ethics. The Bible teaches that God is our Creator and has full rights over life. The world tells us that if we sign our driver’s license we can be in control of our organs and choose to share them with people in need. Rational people of faith fear God and respect his sovereignty over all life. It is He that has made us, and not we ourselves. (Psalm 100:3) Yet there are many ways to extend or manipulate life and God in his permissive will does not step in to prevent these. In fact, we can be sure that he has enabled many of them. Then there are cases so unnatural that we see no divine involvement, but no life extends beyond God's power to end it. At times we see negotiations going on between Father and child. That is a new subject. If we choose to be organ donors, we know that we will be allowing others to be in control of the timing of our death. This will not trouble the person who accepts the new definition of death, “brain death.” (See Post 4) It may not seem consequential in that brain death is a tiny step away from true death. Or is it? There are many stories of comatose patients who could hear the doctors discussing how to proceed since the patient was dead. An example is here. To avoid this dilemma, don’t sign your driver’s license and do state in your Advance Directive that you don’t wish to donate your organs. Be aware that there is a movement afoot to euthanize those in certain categories so that their organs can be harvested, and in some places in the world this can be done unless the person explicitly opts out of donating his organs. There is a need for people to become activists in the right to life movement that warns against doctor-assisted suicide and euthanasia; however, many pro-lifers approve of organ sharing. The church approves, so why wouldn’t they? Same for IVF, life invented in petri dishes. Would you agree that God is offended with people who take from his hands the natural process he established to end life when these means are odious? Or, for that matter, the natural process to begin life? Is there a difference between scientists who work to find cures for diseases or medicines for palliative care and those who find ways to extend life through organ sharing procedures? Once it becomes ordinary to take the reigns over life from God's hands into our own, we feel the ground of morality slipping. Now the young adult who is in dark and endless depression can be euthanized and harvested; next the prisoners; then the children: Where will it end?